The Law, Books, and Life: Ever Have Moments Like This? The American Christian Fiction Writers conference is coming up incredibly fast. In two short months, I'll be in Dallas learning more about writing, reconnecting with old friends, meeting new friends, and having an incredible time. Last year Karen Ball was the keynote speaker. Karen displayed a fun sense of humor (haven't laughed that hard in a very long time) while allowing herself to be incredibly vulnerable and open. A line that repeated throughout the four days was goldfish moments. It started in one of Karen's talks and burbled over to the rest of the conference from there. 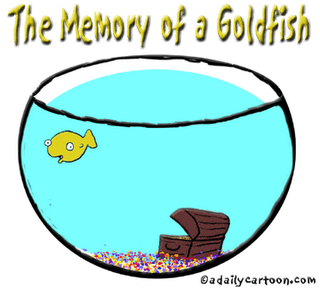 Did you know that someone has actually studied the attention span of a goldfish. First, who has the time to do something like that? Second, how on earth they actually created a study that let them determine what's going on in a goldfish's brain? Third, I just want to laugh as I consider the parallels between a goldfish and me. Supposedly, a goldfish has the attention span of about five seconds. You can hypothesize that's why they're content swimming around in a little bowl. "Look -- a castle." Glub, glub, swish, swish. "Hey, look. Another castle!"